A couple of weeks ago, Josh and I went on our first trip to Ashland, Oregon. We woke up on Saturday morning craving adventure (and fall apples) and decided on a spontaneous trip up I5 to the place where we were told we could find apples. Since it was the very last minute, we were skeptical that we would find a decent place to stay that evening. Before we packed up the car, we perused Air BnB and found a quaint little “glamping” site on a couple’s farm just outside of Ashland. According to the reviews, it was a highly sought-after place to stay and it was quite miraculous that it was open for the night. We quickly booked it and gathered everything we would need for our overnight adventure. We picked up coffee at our favorite coffee shop (Heritage, of course) on the way out of town. The day was extraordinarily beautiful. We rode with the windows down the entire way as we sped along at 75 miles per hour and basked in the beauty of the mountains on either side of our little Honda Civic. We reached Ashland barely two hours later and stepped out of the car into fresh, crisp air in this quirky little city that we had been dreaming of visiting for months. After we visited the ATM to get cash for apple picking, we trekked out to the orchard we had selected to pick our fruit. Josh and I were both pleasantly surprised at how much we loved the orchard. It was nothing like the orchards in New York that we are used to, with the chilly weather and hot apple cider and hundreds and hundreds of city dwellers who flock to the suburbs to have an “authentic” apple picking experience. 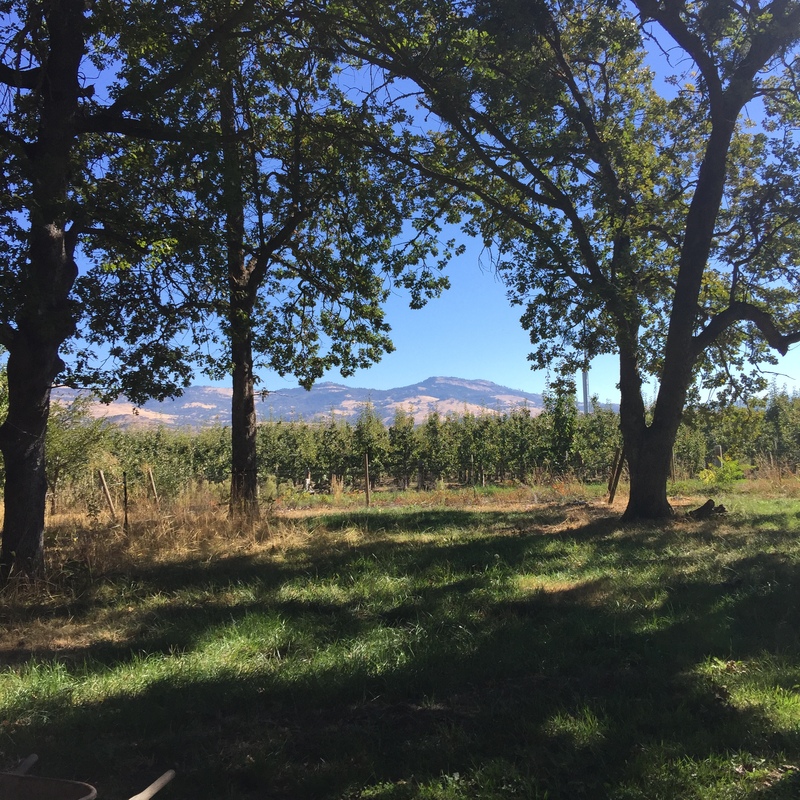 Here in this little slice of paradise in the Northwest we were the only two people amongst the pear and apple trees that were planted strategically between nectarine trees and a vineyard. We picked ten pears and a dozen or so apples, including Pippins, a variety with which we were unfamiliar but instantly fell in love. After picking our fruits and buying 20 ounces of pressed apple cider, we went on our way to visit our little home for the night. The glamping site was everything we had imagined it would be. It was a big tent with a wooden floor and a queen-sized Tempur-pedic bed. The shower and toilet were outside protected by a wooden fence. The owners even prepared the fire pit for us so we could have a fire when it got dark. It was the perfect place to relax and unplug for the night. After we met our host, we explored a bit in downtown Ashland. We did as much window shopping as we could handle before our tummies started growling and then went to one of the breweries in town for burgers and sweet potato fries. After we had quite exhausted ourselves with shopping/antiquing and stuffed ourselves with yummy food, we traveled back to our glamp site. We sat around the fire for a bit and then snuggled into bed, lulled to sleep by the sound of crickets and very distant traffic on the interstate. The next morning, I woke up to an incessant pecking noise. I couldn’t quite place it until I was laying out on the hammock and happened to look up at one of the trees. There, high up in the tree, perfectly balanced, was a beautiful red and gray woodpecker. We decided to investigate further and as we walked around the tree discovered that it was entirely riddled with holes from about halfway up the trunk to the very top of the tree. As I contemplated the life of this woodpecker, I thought about how his entire life is committed to drilling holes in trees because his livelihood depends upon it. His dedication to that one tree and to his life’s calling impressed me. I left wondering how I could apply my observations of the life of a woodpecker to my own life. This past weekend, we had the opportunity to attend a conference at one of the churches here in town. The focus of the conference was on creativity and how to use our voices and talents creatively for the Kingdom of God. One of the speakers, Havilah Cunnington, emphasized the importance of “staying in one’s lane” when it comes to creativity and life in general. I thought back to that dedicated woodpecker. I thought about how he knew exactly who he was. He understood that the way he would find food was by drilling holes in a tree. He didn’t try to dig in the ground or catch bugs on his tongue or swoop through the sky searching for smaller birds on whom he could feast. He pecked a tree. And he had a great life. When I was in high school, my brother and I took art together. At the end of every day, my mom would look at what we had created based upon the assignment. And every day she would wonder what in the world I was trying to create. The problem was, drawing and painting did not come easily to me and I honestly didn’t enjoy either one. I did what I had to do to get through art class, but I was very glad when the year was over and I could return to my normal life. I’m not saying that I’m not creative. In fact, I learned around the same time that I loved writing. In college, I started my first blog. English Comp I was my favorite class freshman year. Not only did I love writing, I was actually good at it. There have been moments when I’ve wished I was the type of artist who could sit down and paint on a canvas and have people line up to praise my work. But, by staying in my lane, I am able to paint pictures with words and stories that no one would ever get to experience if I didn’t sit down and write them. I will never forget my weekend in Ashland. Nor will I forget the lesson I learned from that woodpecker, who taught me that staying in my lane will in the end be far more rewarding than trying to be someone other than the person God created me to be.